Preheat the oven to 350°. Brush a large rimmed baking sheet with coconut oil and arrange the squash in a single layer. Roast until tender, about 30 minutes. Transfer the squash to a large bowl and mash with a fork until smooth. Stir in the chickpea flour, parsley, cilantro, garlic, coriander, cumin, cayenne, 1/4 cup of the lemon juice and 6 tablespoons of water. Season the falafel mixture with salt. In a shallow bowl, mix the sesame seeds. 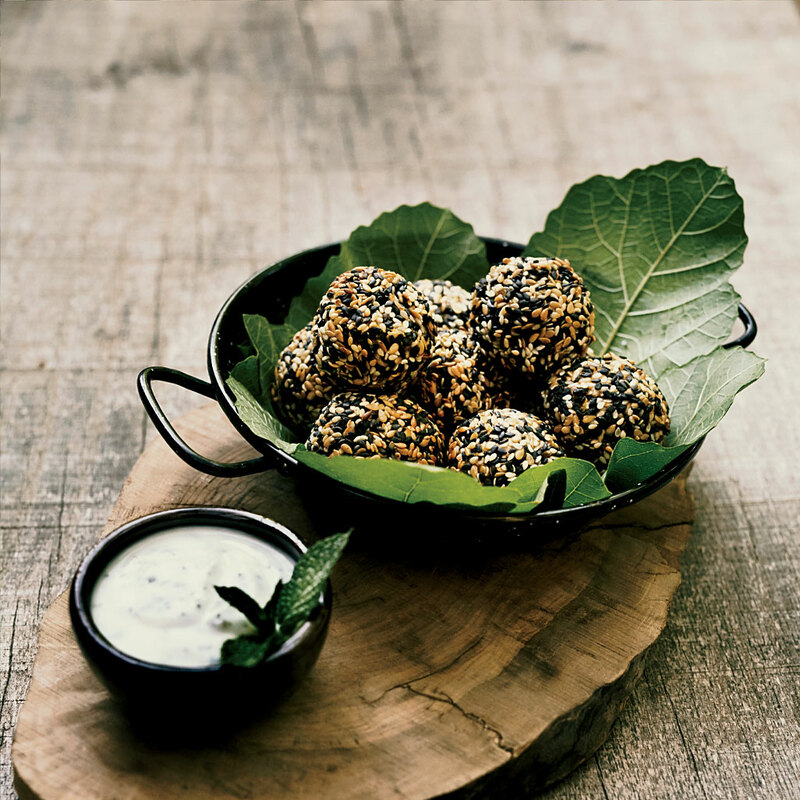 Shape the falafel mixture into 16 heaping-tablespoon-size balls and roll them in the sesame seeds, pressing to adhere. Transfer to a large rimmed baking sheet. Gently toss the falafel with the 2 tablespoons of coconut oil and space them at least 1 inch apart on the baking sheet. Bake for 20 minutes, or until crisp and starting to brown in spots; turn the falafel halfway through baking. Meanwhile, in a small bowl, whisk the yogurt with the mint and the remaining 1 teaspoon of lemon juice. Season with salt. Serve the falafel warm with the yogurt sauce. The recipe can be completed through step 3, covered and refrigerated overnight. Chickpea flour is available at Indian and Mediterranean markets, as well as at Whole Foods.